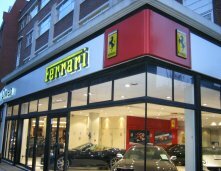 High street shopfront signs act as a round-the-clock promotional media for your business. High quality signs help your business stand out in busy roads and highways and will get your business noticed 24 hrs a day. From wayfinding and directional signs to post, panel and totem signs, we offer a full advisory and design service to give your location and facilities the professional appearance you demand. Our outdoor signs are made to look exactly as you want them and made from top quality materials. We also offer a full sign maintenance service to ensure your investment in business signage continues to provide a good return on investment. Smarten the look of your premises to entice new clients. Fascia signs are important in accurately identifying your company or business. 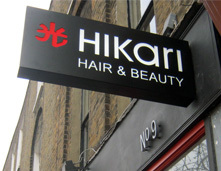 A well designed and appropriately targeted sign will portray the right image in attracting your customers. 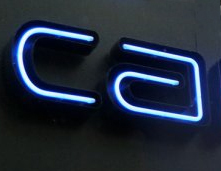 To make your sign stand out from the crowd, whether during the day or at night; the key is illumination. Illumination increases visibility and stimulates the visual senses of pedestrians and passers by. 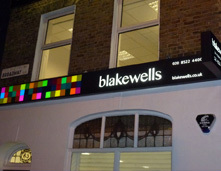 Projection signs are usually formed to compliment the existing style of the main facia. 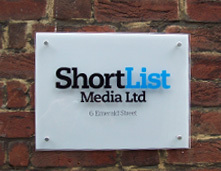 These smaller signs are designed to catch the eye at a point farther along the street from the shop or the office. They are either positioned directly on the main fascia sign or on the dividing pillars between shops or offices. The neon sign is starting to be used once more by select businesses and are especially popular with artists and architects. With careful thought and design a neon sign will illuminate your business sign with that retro feel and have the same effect of attracting business as it once used to. We manufacture bespoke plaques to meet your requirements in a variety of different materials including Perspex, glass, wood, brass, aluminium and steel.